In his vivid and thought-provoking filmmaking debut, cancer-survivor and physician Ryan McGarry gives us unprecedented access to America’s busiest Emergency Department. Amidst real life-and-death situations, McGarry follows a dedicated team of charismatic, young doctors-in-training as they wrestle openly with both their ideals and with the realities of saving lives in a complex and overburdened system. 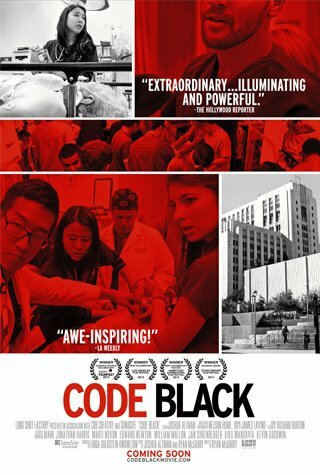 Their training ground and source of inspiration is “C-Booth,” Los Angeles County Hospital’s legendary trauma bay, the birthplace of Emergency Medicine, where “more people have died and more people have been saved than in any other square footage in the United States.” CODE BLACK offers a tense, doctor’s-eye view, right into the heart of the healthcare debate – bringing us face to face with America’s only 24/7 safety net.